Built before the technological renaissance that saw a more open view of quadruped 'Mechs, and introduced by the Terran Hegemony in 2570, the Scorpion is an example of an idea that was ahead of its time. 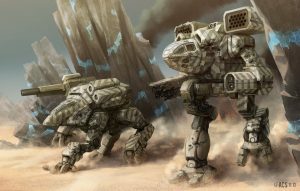 The 'Mech was originally intended as a stable weapons platform but as the model came into service it was relegated to an infantry support role. The design itself was also shunned by most MechWarriors due to the rough ride of the four-legged gait. 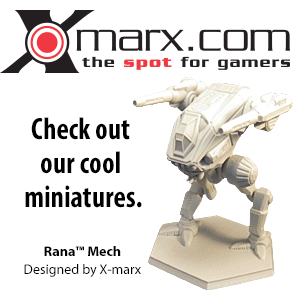 If the design is looked at through an objective standpoint, the Scorpion is a very capable 'Mech at its intended role. With the PPC mounted in the body and with the inherent stability of the design, the 'Mech is a very stable platform for long-range fire. One quirk in the design, though, that does put it at something of a disadvantage is the lack of jump jets used on most medium 'Mechs. The top speed of 97.2 kph, however, does help to alleviate any maneuverability concerns a pilot may have. At some point there had been an attempt to create a LAM version of the Scorpion, an unworkable project that was abandoned and literally buried in a bunker on Hesperus II. The long-forgotten blueprints and prototype remains were found by chance in 3065. Although the Scorpion LAM project as such had been unsuccessful, it had succeeded in streamlining components and redesigning the leg suspension, and applying these modifications alleviated the famously bumpy ride on the -12S and all subsequent variants. The Scorpion carries a very basic weapons payload. Its primary weapon is an Anderson Armaments PPC which, when combined with the Scorpions highly stable chassis, makes the 'Mech an ideal close support 'Mech. For close range combat, the Scorpion carries a Marvel Six-Load SRM-6. This weapon allows the Scorpion to capitalize on any breaches in the enemy's armor. The scorpion has another, smaller swivel-mount looking tube beneath the cockpit, perhaps intended for a flamer, machine gun, or small laser, but this mount does not actually work and is purely cosmetic; speculation is that it was dropped after the frame was completed and removing it would have slowed down production. The (original) Scorpion variants and artwork from 3025 were part of the Unseen 'Mech designs. The Scorpion was Reseen in 3067 with new variants using revised artwork. Scorpion LAM - A failed attempt to develop a Land Air Mech version of the Scorpion, this prototype nevertheless led to marked improvements to ride smoothness in later variants of the original. Wendall Puritan - Noted Scorpion pilot, Puritan left the Lyran Guards after House Steiner announced they were phasing the design out of the Lyran Commonwealth Armed Forces, opting to join the Smithson's Chinese Bandits mercenary unit rather than see his family 'Mech scrapped or pilot another design.